As a mom of two little boys, quick clean ups are frequently required. Whether it is wiping up the messes by the bathroom sink, cleaning up misses by the potty, or getting pasta sauce off the stove top. We always have disinfecting wipe containers in the house for just these types of occassions. Hubby and I would always get frustrated with them because of the dispensing container. The small round hole at the top always managed to rip the sheets (and hurt our fingers), rendering the wipe useless. Thanks to Family Review Network, my family recently had the opportunity to try the new Clorox Disinfecting Wipes Decor Canisters. I must admit, I was skeptical at first. I figured that they would be exactly like the other Clorox wipes I had used in the past at home and in the classrooms when I was teaching. Boy was I wrong! When I opened up the box of Clorox Disinfecting Wipes Decor Canisters, I noted several items. Of course, the size and shape of the canister was quite different. Then the opening within was much different. 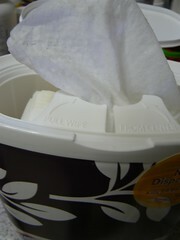 Unlike the other wipes I had used in the past, these wipes were easy to get out. 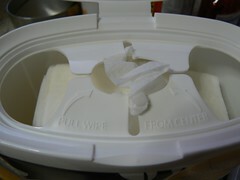 The opening was wide enough for adult fingers to comfortable get into and not get cut on the plastic side. I never wasted one thanks to it shredding while removing it from the container. I also noticed the texture on the wipes. The wipe itself had a textured area and seemed a lot thicker and more durable. When I used the wipe to clean my stove top the first time, it held up beautifully to the test. It lasted for the entire job, did not dry out and the texture on the wipe really helped to remove the dried on sauce. Thanks to The Clorox Company, 3 lucky winners (US addresses only) have a chance to win a coupon for their own free Clorox Disinfecting Wipes Decor Canister. 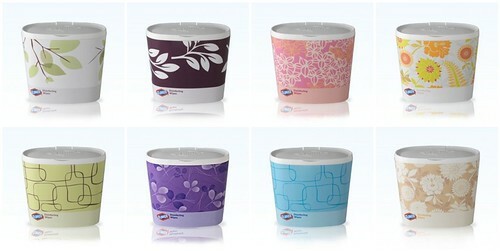 MAIN RULE – Visit the Clorox Disinfecting Wipes Decor Canister page and then come back and leave a comment telling me which design you would pick and what room you would put it in. 1-2 Bonus Entries – Stumble this post and/or my main blog page and leave your Stumble name in a separate comment. 1 Bonus Entry – Follow me on Twitter @TheAngelForever and tweet the line below and leave a direct link to your Tweet in a separate comment. To enter, just follow the rules above within the comment section. Be sure that I have an e-mail address that I can contact you for a mailing address once the giveaway is over. All entries must be received by 11:59pm on Tuesday March 31, 2009. I will pick the winners using random.org and contact you via e-mail. You will have 48 hours to claim the prize. If no response, another winner will be selected. Purple Clovers were be my choice of canister. Really decorative and very pretty. Subscriber by RSS feed to my google reader. The pink would go great with my kitchen! I tweeted, but I’m dumb and can’t figure out how to paste the link to my direct tweet here! I would get the pink canister with the flowers– so pretty! I registered to the RSS feed at the top of the page as well. I like teh purple clovers. I would put this in the kids’ bathroom. I like the Green Flowers and I would keep this in the kitchen. I like that it is cute so it can be left on the counter. I would choose Green Leaves and use it in my newborn’s room! Thanks! I’d choose the beige flowers design for my kitchen. Thanks. I like the green leaves. I love the purple clover canister!! Jennifer’s last blog post..I’m Ready for Spring Break! My favorite is Citrus Jungle. Thanks for the giveaway! I like the light blue geometric print for my bathroom! Thanks to all that entered this giveaway. Comments are now closed and the winners will be e-mailed shortly.